Arrived together in Singapore on 6 Sep 2013, Ximula and Gracefully are two beautiful 40ft Lagoon 400S2 sailing catamarans. Well-known for their elegant and practical design, the Lagoon 400S2 model delivers comfort and space more than any other similar-sized catamarans, making it a popular boat for yacht charters. With a spacious interior and wide sun deck, each can comfortably accommodate up to 18 guests, providing an ideal setting for a relaxing get-together with loved ones. Did you know? Ximula and Gracefully are identical twins! Not only are they the same in make and model, they also both arrived in Singapore on the exact same day, 6 Sep 2013. Owned by a humble Singaporean family, Ximula was a childhood dream come true for TC Wong, who has dreamt of sailing around the world since he was a teenager. After working very hard for many years as the sole breadwinner for his family, he is finally able to fulfil his dream with the arrival of Ximula in Sep 2013. Since then, he has entertained his company staff, business associates and clients, family and friends on board, bringing them out for sailing around the Southern Islands of Singapore. Ximula officially started hosting yacht charters in June 2014 when he and his daughter, Minqi, founded Ximula Sail. Together with family and friends, Wong has also sailed Ximula to many beautiful destinations within the region, including Thailand, Malaysia and Indonesia. Owned by local celebrity couple Darren Lim and Evelyn Tan, Gracefully was a home for the TV actor and actress and their 4 adorable children. Known for their out-of-the-box lifestyle, Darren Lim and Evelyn Tan have been raising and homeschooling their 4 children on board Gracefully, which is their fourth houseboat. While living on board Gracefully for 3 years, the Lim family was able to sail to many beautiful destinations within the region, including embarking on a sailing expedition to Koh Samui, Thailand together with Ximula's Wong family. Through the expedition, both families shared their passion for sailing and love for the outdoors and adventure. 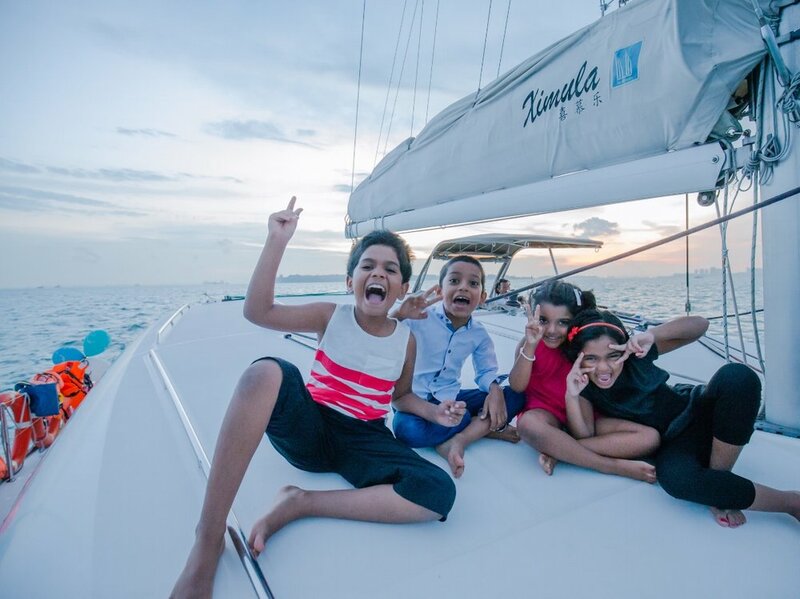 As the Lim family moved back on land to prepare for their eldest daughter, Kristen's PSLE exams, Gracefully officially started hosting yacht charters in June 2017 as part of the Ximula Sail fleet.